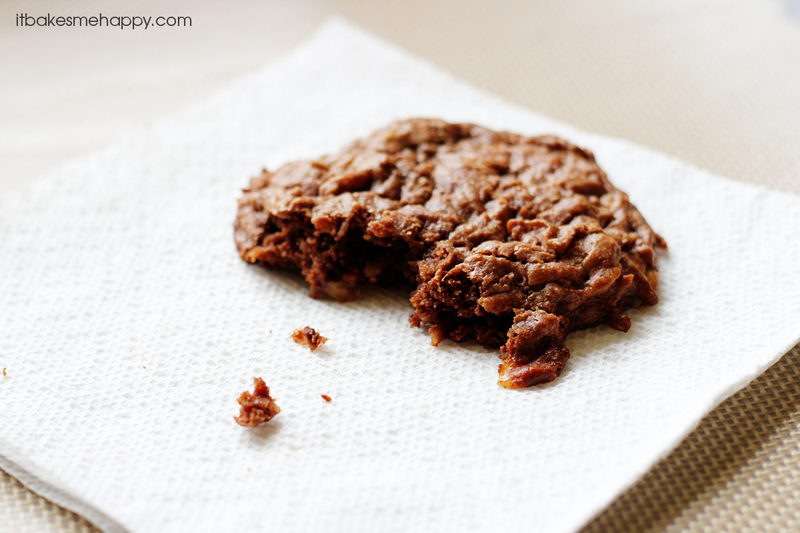 Rich chocolate cookies loaded with chocolate, coconut, and bits of toffee, grab a glass of milk and dive right in to this dessert. Last week my mom came to visit for a couple of days, so of course we had to make cookies! What better way to celebrate our time together than with cookies filled with chocolate, coconut and toffee. These taste amazing! and I’m not just saying that, even my toddler loved them. Served warm with a cool glass of milk, you will probably want to eat more than one. So if you love a good cookie, then you owe it to yourself to make a batch of these – enjoy and happy baking! Preheat your oven to 350º and line a baking pan with parchment or a baking mat. In a microwave safe bowl melt the chocolate chips for 1 minute, stir until smooth, if the chocolate isn't completely melted continue to heat in 15 second intervals. Stir in the butter, mixing until smooth. Working quickly, whisk in the egg and vanilla. Stir in the coconut, toffee chips, brown sugar, flour, baking powder and sea salt; drop by 1/4 c dollops onto the baking sheet and bake for 15 minutes, until the edges are set. Cool on the pan 3-5 minutes and serve. Yum! You just can’t go wrong with chocolate and coconut. Love the two flavors combined. Chocolate and coconut? You can never go wrong with those two ingredients. Thank you for sharing at Foodie Friends Friday. Chocolate and Coconut are two of my weaknesses and here you have them combined ! Love it 🙂 Thank you for sharing at our ALL MY BLOGGY FRIENDS party ! ha ha Lindy you will love them!